GL Lighting is proud to present our LBR 3-Tube Drop-In Fitting. These fittings can hold 3 Tubes. 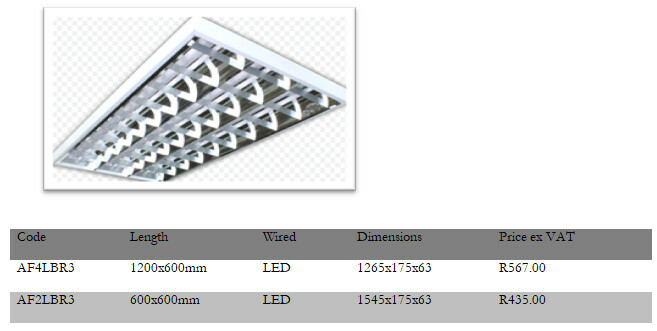 A high quality commercial, IP55 rating, surface mounted indoor light fitting. Fitting is supplied standard without LED tubes and is wired for LED. Refer to the tube light section on our website for our range of LED tubes which includes the Standard, Premium and Premium + Range tubes which are manufactured in Edenvale on the East Rand, Johannesburg, Gauteng, South Africa. We also supply fittings to our neighbouring countries including Zimbabwe, Botswana, Namibia, Mozambique and Zambia.